To open .lxf flies, download Lego Digital Designer (LDD) here. 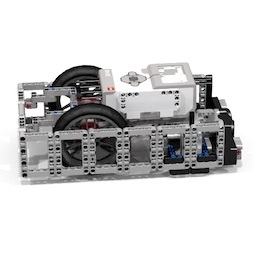 EV3Lessons does not take responsibility for the quality of build instructions provided. Please refer to our copyright license information. If you use any part of any of the robots on this site in your classroom or camp, you must credit the original designer for the work/idea. If you use any materials in a contest (with or without modification), you must document and inform judges where the original ideas came from. This build replaces Droidbot 1.0. 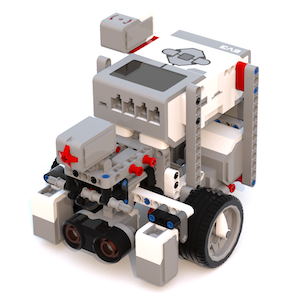 Droid Bot 2.0 is a robot build using only parts from 45544 LEGO® MINDSTORMS® Education EV3 Core Set + 1 color sensor. There is also an optional handle that can be added when the robots are used in camps or classrooms. 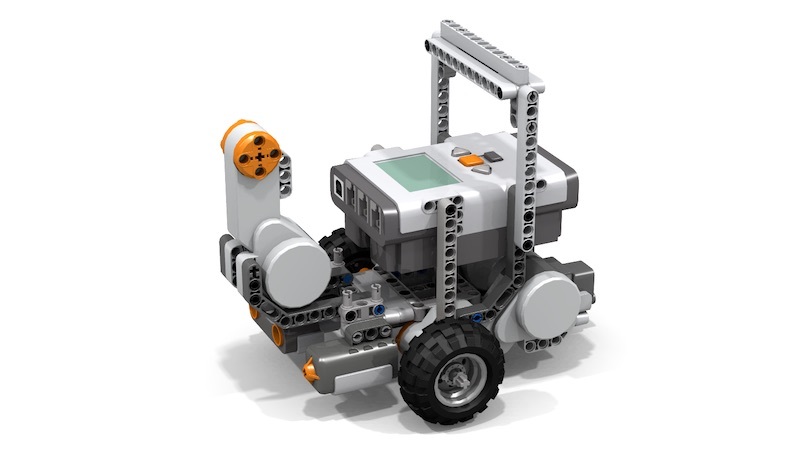 Endeavour is a basic robot build using *only* 45544 LEGO® MINDSTORMS® Education EV3 Core Set. Note: You will need a second color sensor to do the Squaring lesson. 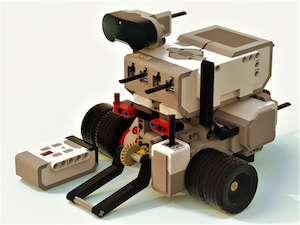 This new NXT robot design is compact and very sturdy - ideal for classroom usage. It has been designed for use in our lessons and also works well on our Training Mats. We name it Cyberbot because of its distinctive handle which makes it look like a Cyberman from Dr. Who. The robot features a shielded color sensor as well as modular/easy to add sensors and a third motor. 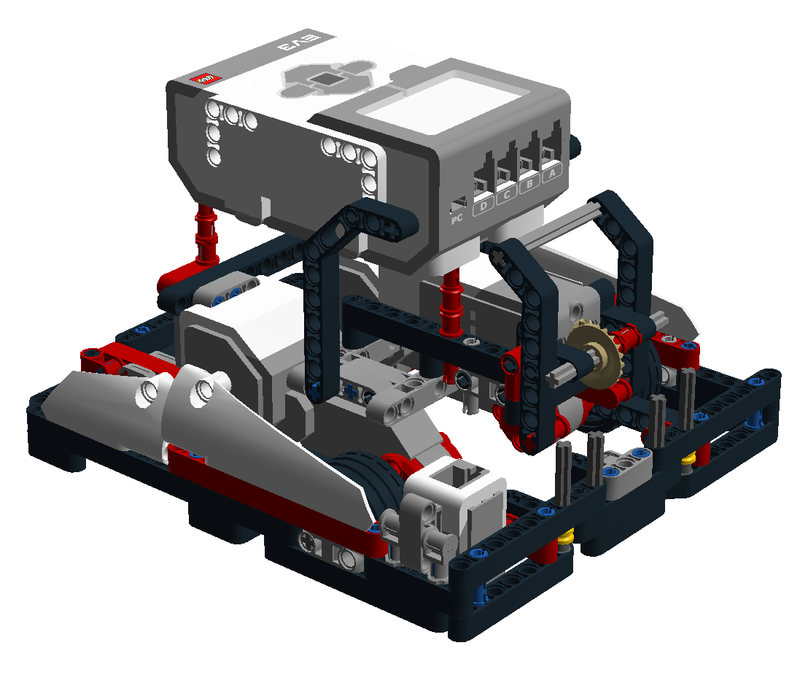 These designs have been contributed by members of the FLL and Lego Robotics community. Unless you see a "tested and approved by Droids Robotics/EV3Lessons" these designs have not been used with our lessons. They are included here to give you inspiration/ideas. They may require parts beyond the retail or educational kits. This is a simple, quick-build design that has been used by classroom teachers around the world. You can easily add attachments and sensors to this build. 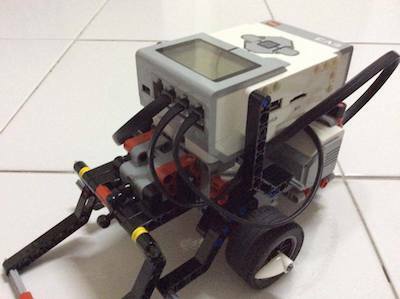 This is a basic robot using the NXT that is good for classrooms. Since the brick is low to the ground, this design is a very stable build. The design incorporates all the basic sensors needed for classroom activities. Design by: Dr. Damien Kee. This is a simple, quick-build design that can be built easily by students in a camp. 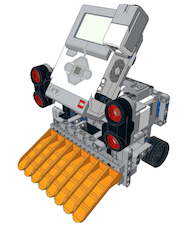 This is great starting robot design that uses the NXT. It features an outer wall as well as two touch sensors. This robot can also line follow. 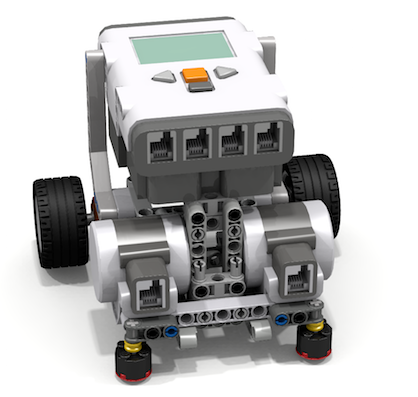 Compact Bot is a basic robot build using the 45544 LEGO® MINDSTORMS® Education EV3 Core Set + 1 motor. It has a back bumper for aligning (straightening the robot by bumping into walls and objects) and a third large motor for attachments. There are a few variations on the build available on this site. This robot is a good starter robot. 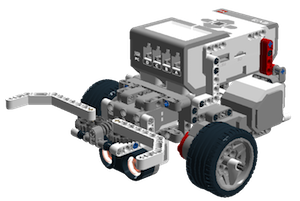 It can be built using the EV3 Education base kit plus 1 color sensor and an NXT motor. The sensors in front act as a bumper. This is a robot that has a strong outer frame with shielded color sensors. It uses two color sensors, an ultrasonic and a gyro. It uses large motorcycle wheels and a ball wheel. This robot has been physically built by the designer. 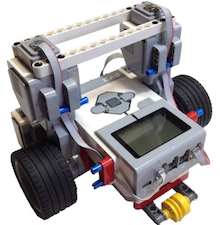 This robot is made with parts in the EV3 home edition only. It has a basic system for attaching motorized and passive attachments. This is a quick-build robot that uses only 37 pieces including motors, sensors and wires. It features the gyro, touch and color sensors. 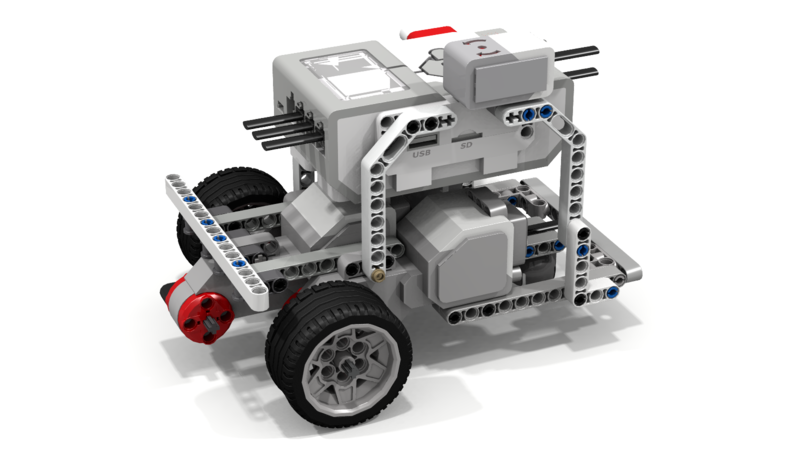 This is a base robot similar to the one available in the Educational EV3 set (45544), but constructed with parts available in the NXT set. 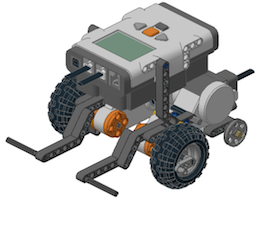 This is a base robot similar to the one available in the Educational EV3 set (45544), but constructed with parts available in the retail (31313) set. 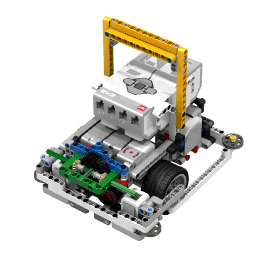 This is a base robot similar to the one available in the Educational EV3 set (45544), but constructed with the NXT. This section is devoted to Sumo bots. This can be an activity for both FIRST LEGO League and WRO teams. 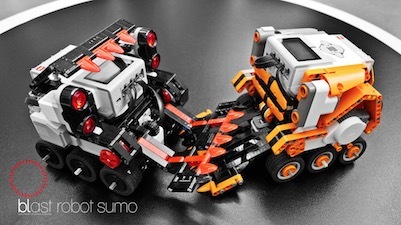 BooYoo and XOR are Sumo Bot design by Vassilis Chryssanthakopoulos. They feature three sets of wheels and two ultrasonic sensors each. To learn more about these robots, read this article. 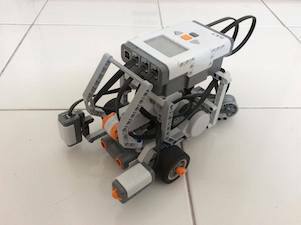 SamBot is an EV3 Sumobot design by Anderson Harayashiki Moreira. 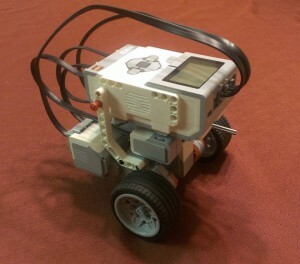 It features two ultrasonic sensors and a ramp made of LEGO Brick Separators. 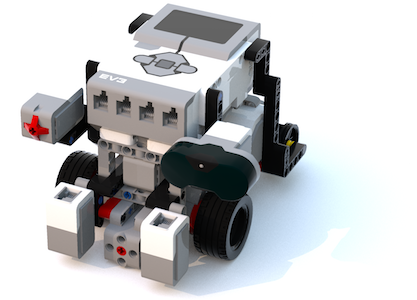 This is an EV3 Sumo Bot design by Mr. Phil. It uses Mindsensor's SumoEyes. It is shared here with his permission. For more information on this design as well as lots of resources and documentation on the SuGO competitions visit the GEARS website devoted to SuGO . 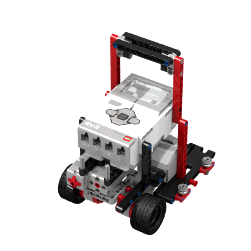 This Sumo Bot can be built using the LEGO Mindstorms EV3 31313 retail set's parts. It features a front flipper, wide rubber tires for good traction, and the EV3 Infrared Sensor for manual operation via the EV3 Remote Control. Download the "Custom Remote" .ev3 project file for Remote Control operation. 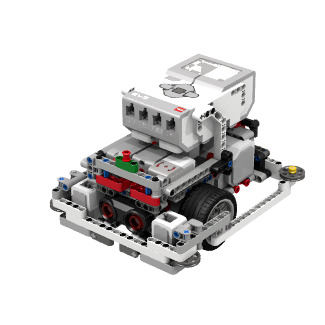 The EV3 Color Sensor allows for the robot to back up when "seeing" the perimeter line around the Lego Sumo ring. 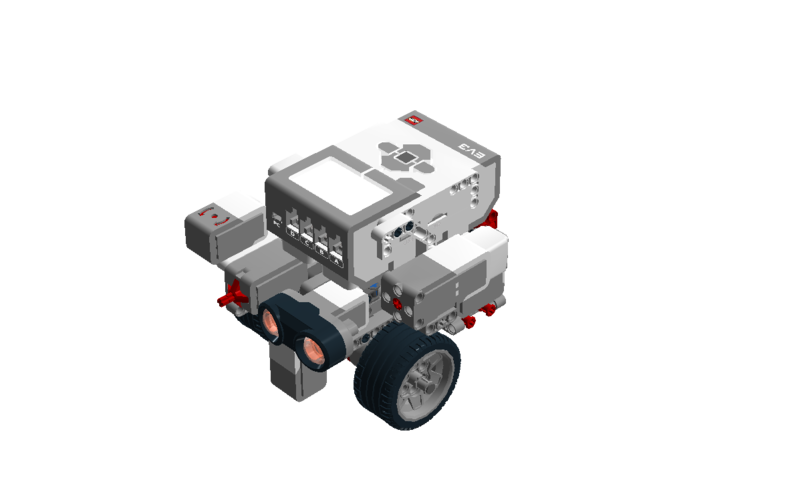 As an option, the pair of red 2L Technic Axles allow for mounting the Mindsensors "Sumo Eyes" to run the SuGObot program. 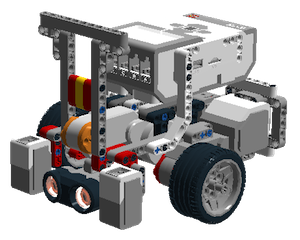 This LEGO Mindstorms EV3 Sumo Bot uses three EV3 Large Motors, two of which have "triple torque" due to gearing. In the false-colored picture, the pink 12-tooth gear that is directly connected to the EV3 Large Motor touches the turquoise 36-tooth gear. This "gearing down" increases its torque three times, for increased pushing power. 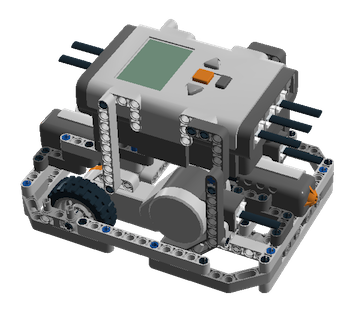 The center motor operates the yellow "flipper" arms for upending opposing robots in a Lego Sumo or Battlebot competition. 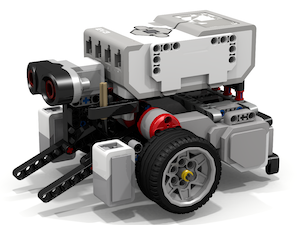 Parts from the EV3 45544 Education Set are supplemented by the third motor and EV3 Color Sensor (for detecting the edge of a Lego Sumo arena). You can use your spare parts to make the flipper larger; with it in the "up" position, it measures ~7"x7" (~22x22 studs). The EV3 Ultrasonic Sensor detects the opposing robot, or it can be replaced by a Mindsensors "Sumo Eyes" sensor for SuGObot competitions.